Crestfallen Warrior is a NPC in Demon's Souls. The Crestfallen Warrior is among the first NPC's encountered by the player. 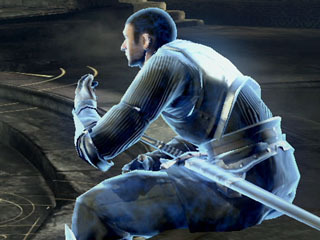 He sits in the Nexus in front of the Boletarian Palace archstone, and serves to introduce the player to the concept of Phantoms in the game, and to point the player to the nearby archstone. It can only be assumed that he is either a fellow hero in line with the player who went to Boletaria for an unspecified reason, or a former soldier of Boletaria trapped in the Nexus, like Stockpile Thomas and Blacksmith Ed. He is extremely cynical about the entire situation surrounding Boletaria, calling the acquisition of souls pointless and implying that the player is just a sap falling for the same trap as King Allant. He eventually succumbs to his own apathy, slowly losing his mind as either a result of his losing the will to live (and, since he's already dead, that actually meaning something) or as a result of going too long without being attached to a body. Although how he turned into a soul is undetermined, it may have been due to his soul being weakened from him losing the will to live or by him staying separated from his body for too long. In your first conversation with him, he points you towards the Boletarian Palace archstone as the place to go for demon souls. During later conversations he may note when you have lost or regained your body, and warn you when you gain a Demon's Soul that you are falling into the same trap that King Allant did. If you talk to him regularly as your game progresses, his conversations will reveal he is very depressed and is losing his memory. After you defeat the Tower Knight his final dialouge is unlocked.If talked to he'll eventually disappear and leave a Storied Soldier's Soul. If you do not exhaust his conversation, he will stay around for the duration of the game. Which you may want if you intend to murder him late in the game to lower your character tendency for Mephistopheles. Sitting in front of the Boletarian Palace archstone. The blue phantom is pretty tough to take on with a new character right from the tutorial, but it is possible to do. You have to be wary of his melee ability and his guard is quite annoying. The key to this battle will be a shield of your own, and a defensive style. Classes without a good 100% damage reduction shield will need to watch their HP as well as their stamina bar. Being aggressive towards the phantom will only end badly because he is very hard to guard break, hits quite hard, and is very quick at blocking after he attacks. Block his attacks and counter only once when he recoils off of your shield; the phantom is very good at blocking immediately after you get one hit in, so stop right after this and wait for an opportunity. Wear him down this way. Another good tactic is to constantly bait him and move in and out quickly. The Phantom will eventually do a full combo after which he will stand open for a moment if you keep baiting him. You can use this opening to get a combo in on him or even backstab him if you are quick, he won't block if you catch him at this moment; instead he will roll away and do the rolling slash. You can always just use magic from range on him if you are either Royalty or magician, but you will need a lot of spices to keep your mana going. Both Flame Toss and Soul Arrow are good choices. Flame Toss will do more damage to him through his shield and if you Soul Arrow him quickly enough in succession, you can break his guard, and get a free hit on him if you keep spamming. Use the terrain in the Nexus to force him to get hit: get him to follow you across the bridgeOstrava sits on and you can bombard him all the way down, and you have a quick escape route by rolling off the side. You can also let him kill you once, then he'll be on defense from the start, then you lure him in the stairs by locking onto him and shielding yourself. When you're high enough in the stairs to the Monumental, make him fall by hitting him. You can use this method on any soul level. Note: These are only low level strategies, meant for straight after the tutorial. Of course, if you wait and come back later to kill him, you can use any number of ways to finish him. Well, you slipped through the fissure too, did you? You came for Demon Souls? Or to save this land, and be remembered as a Hero? Hunting for Demons? Try one of the Archstones. Now, go. That's why you came, is it not…? To this accursed Boletaria. Bah, it's all the same. You're just another prisoner of the Nexus. We're welcome here as long as we keep slashing up Demons. Have you met the last surviving Monumental? Those fools revived the Old One on a whim. And now they've trapped us here, in a desperate attempt to undo their mistake. It's all a travesty, if you ask me. Still alive? I am impressed. This is something that might interest you. The Black-Robed Maiden is a morose type, with eyes occluded by wax. She can control souls like no other. Bring her the souls of men and Demons, and she will embolden your flesh and blood with their power. What’s happened, Have you lost your nerve? No matter. Have a seat; we can sit here forever! At least we will be safe! Hahahah, you've gone and died, have you? If you die here in Boletaria, your soul is returned to the Nexus. Well, what'll you do next? Going to just give up? Well, you’ve found yourself a Demon’s Soul, have you? I’m impressed…yes, indeed I am. Stay the path, and you will soon be a monster yourself! Can’t you see you’ve fallen for their trap? The disciples and the magicians in the Nexus despise one another. Did you notice they never sit in sight of each other? The fools. What good comes of childish rivalries? We are all prisoners here. You… have you seen my corporeal flesh? Has my body gone rotten? I’m sorry… please leave me alone. Even I will not just sit back and take it!